Broadway actress and guest director Nancy Anderson along with a cast of 34 theatre, music and musical theatre students will boldly take the American musical where it has never gone before in the James Madison University School of Theatre and Dance's production of Green Day's American Idiot, a two-time Tony Award-winning musical that takes place Tuesday through Friday, February 19-22 at 8 pm; Saturday, February 23 at 3 pm and 8 pm and Sunday, February 24 at 2 pm. The performance will be held at JMUs Forbes Center for the Performing Arts. Rosie Staudt, of Ridgefield and majoring in Musical Theatre will be performing in this musical. With a book by Michael Mayer and Billie Joe Armstrong (the lead singer, songwriter and guitarist for the rock band Green Day), this high-octane show is more like an elongated music video, which is "what a rock musical should be," says Anderson, who recently served as Glenn Close's understudy in the Broadway revival of Sunset Boulevard. 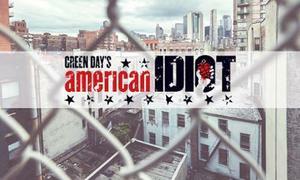 Green Day's album, American Idiot, "is used like a film score, which creates the bed for slightly more oblique storytelling with fewer scenes, fewer lines, and more imagery and movement. The result is a musical that is the granddaddy to shows like Hamilton, which follows a similar storytelling style." Delivered in the vehicle of rock music are issues pertaining to politics and addiction in a post-9/11 Bush administration. "This show lands squarely in the center of those issues, which started to build around 2005 and have only augmented because of 24-hour news and social media," says Anderson. "In a generation fighting against the digital age, Americans didn't want to become 'idiots,' or told what to do by television or mass media." Similarly, characters in the show seek to break out and find their own paths. Johnny, Will and Tunny flee the constraints of their hometown for the thrills of city life, but quickly go in separate ways when Johnny's attention becomes divided by a seductive love interest and a hazardous new friendship, Will stays home to attend to family responsibilities, and Tunny enters the armed forces.